Make more money selling your crochet using these tips. Year after year, many writers purchase Writer's Market and many creatives purchase Artist's and Graphic Designer's Market. These books are designed to help people in their respective industries, providing them with important information about where and how to sell their work. In other words, these are the quintessential guides to making money in creative fields like writing and art. The guides are released annually so that the information stays up to date. Beginning in 2015, a new guide was launched called Crafter's Market. This guide is a one-stop-shop for learning to make money selling crochet and other crafts. One of the things that you'll discover in this book is a listing of all of the latest industry shows, craft fairs and other shows. You'll find information about what the difference is between these types of events, so you can determine which ones are the right markets for you and how to use those events to your best advantage. For example, you will learn the pros and cons of exhibiting at industry trade shows, such as the Craft and Hobby Association (CHA) Conference and Trade Show or The National Needlearts Association (TNNA) Trade Show. You'll learn how these are different from craft fairs and art shows; and you'll also receive a list of these latter opportunities to determine whether or not you want to learn more about attending any of them. The listings, combined with the tips for how to use them, can provide you with a terrific foundation for selling your crochet at fairs and networking at industry trade events to improve your creative career. The other large category of listings that you will find in this book is for craft book publishers and craft magazines. Many crafters make at least a portion of their living by selling articles, tutorials and patterns to these types of publications, rather than simply selling their finished items. This book discusses the pros and cons of that, what to expect, and then provides a comprehensive listing of all of the publishers and magazines that might currently be interested in the type of craft writing that you can do. Crafter's Market has listings for online marketplaces and online communities as well. Use these to find the places where you might be able to sell your products online as well as the best places on the Internet where you can connect with other people in the industry. Determine where you want to start. If you can't afford to attend a show and you aren't ready to write a book, maybe you will look first at the magazine listings. If you really want to sell your items then you may want to look at the section on craft fairs. Arm yourself with pens and highlighters. Prepare to spend a nice chunk of time just doing an initial pass through all of the listings. Highlight any that you definitely want to learn more about. Cross out any that you definitely don't have any interest in. Leave the rest unmarked as future possibilities. For example, I would highlight all crochet magazines since that is what my craft is. I would cross out any very specific magazines for other crafts - such as ones that the listings describe as only accepting sewing/ quilting projects - if those crafts aren't in my wheelhouse. I would leave blank general craft magazines that may or may not take crochet submissions. Make a spreadsheet. Create a spreadsheet for the items that you have highlighted. The spreadsheet should include the name of the publication or event, the website URL for more information, and a place for the date so you can enter what date you made contact. There should also be spots for any deadlines, any fees (such as entry fees for craft fairs) and extra notes. Organize your spreadsheet. If you are working with deadlines then you may want to organize by that so that you can tackle the most pressing stuff first. If not, an alphabetical list or any other method is fine. Work through the spreadsheet to gather information. Begin at the top of your spreadsheet and visit each website to get additional information. Crafter's Market has a lot of information and it is generally up to date. But things can change in the industry so you want to check the website for the most relevant details. In some cases, Crafter's Market will include an email address that you can use to request additional information. Get that additional information and use it to fill in your spreadsheet. For example, Crafter's Market may not have any deadlines listed for a magazine but when I request information I get the submission deadlines for their next three issues. I would update my spreadsheet accordingly. Get to submitting. Once you have all of the information that you need, you are ready to start your submissions. You can organize by deadline and submit accordingly. Make sure to keep track of where you have made your submissions and keep a calendar of all events that you are planning to attend. Go back to the drawing board. If you get all the way through your spreadsheet and are ready to work some more, you can go back to Crafter's Market and start over. You could go through those opportunities that were neither highlighted nor crossed out, getting more information about each to determine if they are right for you. You could also go through the other sections in the book that you hadn't previously; maybe now you are ready to look at the book publishers! Crafter's Market is more than just a list of places where you can sell crochet and craft writing. It also provides excellent information about business for crafters. This is great for all levels of your career but can be especially helpful if you're just breaking in to the craft market. The spreadsheet idea described above is just one way of tracking your use of the book. The book itself actually has a great section called "business basics" that tells you all of the best ways "to stay on track and get paid". It provides useful tips about creating a record-keeping system, invoicing, dealing with taxes, handling copyright and more. Newsletter Know-How by Abby Glassenberg of While She Naps, who previously did a sewing + crochet collaboration with Stacey Trock of Fresh Stitches and shared it in a post I adored. Crafting a Book by Diane Gilleland of Craftypod who provides really honest information about the pros and cons of authoring a craft book. Growing Your Pinterest Following by Emma Lamb, author of Crochet Home. But of course, the writer doesn't have to be crochet-specific in their own crafting for their articles in Crafter's Market to be relevant and helpful. For example, I also loved "25 Lessons Learned from Filling 2500 Custom Orders" by Danielle Spurge and "Hosting Creative Retreats" by Heather Powers. Speaking of creative retreats, Crafter's Market also has a small section of listings for these amazing opportunities. This is great because it provides the must-know information for existing retreats where you can connect with and collaborate with others or work on your own craft in solitude or solidarity. It's also great because just flipping through this section can really inspire you to consider retreats for yourself and how those can help your crochet career. Crafter's Market truly is a comprehensive book providing not only all that you need to know about the many different places for selling crochet but also providing the tips and business savvy that you need to actually make money in craft sales. Finally I wanted to note that despite the comprehensiveness and depth of the information in this book, Crafter's Market is well-organized so that you can easily find exactly what you are looking for. First of all, there is a detailed Table of Contents to take you where you need to go. Second, there are tabs on the side of the book that show where different sections are, so you can easily move between sections, skipping Book Publishers, for example, and thumbing right on down to Magazines. And finally, there are three different indexes for the book to make it even easier to find what you want in this book. First, there is an index of regional craft shows. If you want to exhibit at a craft fair and you know that you don't want to leave your own state or those neighboring yours then you can use this index to find the places that are going to be right for you, weeding out all of the rest in an easy fashion. Second, there's a subject index, where, for example, I can go straight to "crocheting" and discover that there are two dozen entries specific to this topic. Finally, there is a general index, which is the alphabetical type of index we are used to in all of our different types of books. You can definitely find what you're looking for in Crafter's Market! 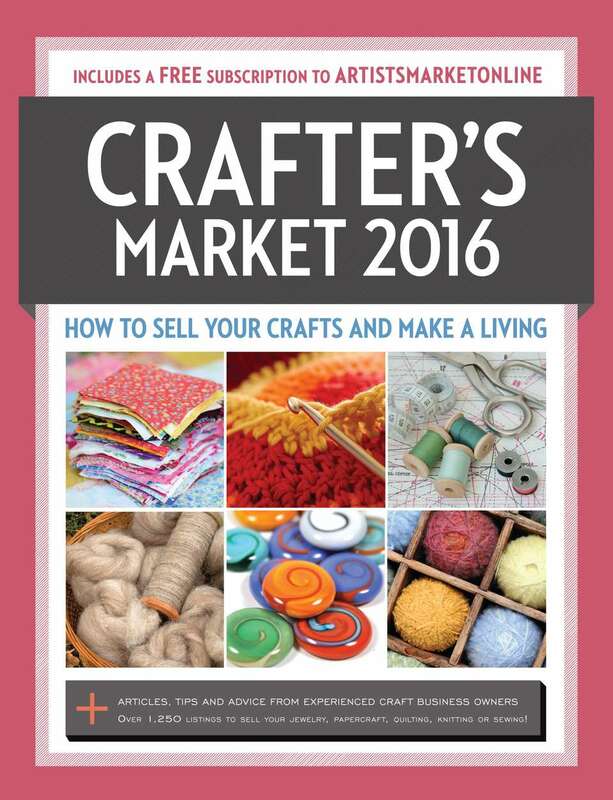 Buy Crafter's Market 2016: How to Sell Your Crafts and Make a Living on Amazon.